Outdoor temperature sensors TOSS is used for sensing temperature outside and indoors where IP65 is required. PT100, PT1000, NI1000, NI1000 TK5000 etc. Passive sensing elements for outdoor temperature sensors TOSS is a low cost alternative to measure temperature with simple 2 wire connection. 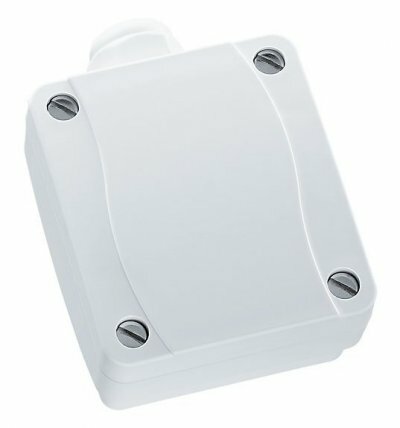 The IP 65 plastic housing for outdoor temperature sensors TOSS is supplied with a plastic cable entry gland, connection terminal is under the cover. The sensing element for outdoor temperature sensors TOSS is placed in a probe outside the housing (external). Always install the outdoor temperature sensor TOSS on north facing wall and at least 2.5 metres above ground. Avoid to expose the outdoor temperature sensors TOSS for direct sunlight, if mounting the unit in sunlight it is recommended to use the sensor shield TSSS. Do not mount the outdoor temperature sensors TOSS close to heat sources such windows, doors etc. The cable entry should be pointing downwards.